Silicone connectors are molded rubber parts that connect the intake pipes and tubes in diesel-powered vehicles and equipment. These engine components resist high temperatures while providing strength and flexibility. Typically, silicone connectors are used in mobile equipment such as generator sets (gensets), ships and boats, and on-road and off-road equipment for forestry, mining, construction, and agriculture. 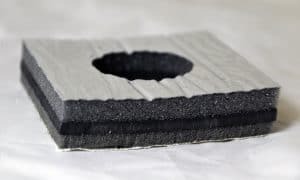 Silicone rubber provides reliable sealing and insulation, but engineers need to select molded rubber components with care. To meet application-specific requirements, a silicone connector may require fabric, wire, or liner materials. Silicone rubber is known for its high-temperature resistance, but engineers need to define their application’s specific temperature range. In addition to heat tolerance, it’s important to specify both the working pressure and the burst pressure. Typically, the burst pressure is four times the working pressure – the recommended maximum pressure for your application. 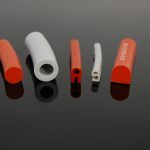 In some mobile equipment applications, engineers need silicone connectors that meet specific standards or industry requirements. Examples include SAE J20 R1 or SAE J20 R1 H.T. Class A from SAE International. Other standards include TMC RP303B Grade I and Grade II and MIL-SPEC A-A-52426. Various heavy-duty OEM requirements may also apply. Choosing the right silicone connector means choosing the right type of product. Categories include silicone elbows, silicone reducers, straight hoses, hump hoses, and wrapped hoses. Straight silicone hoses come in various lengths and can be cut-to-size by your personnel (typically with a razor) or via custom fabrication. Silicone hoses support the use of metal clamps and may contain fabric reinforcements. Wrapped hoses provide enhanced pressure resistance. They are wrapped with polyester mesh, fabric, or an additional layer of silicone. Elasto Proxy can supply the silicone connectors that you need and release quantities on demand or according to your sales forecasts. We maintain warehouses near Montreal and Toronto, Canada, and have a U.S. warehouse in Simpsonville, South Carolina. These facilities are all located near major highway corridors and support fast, efficient shipping. To provide added value, Elasto Proxy can cut silicone connectors using water jet cutting. This saves time on your assembly line or in the field while reducing material waste from low-quality cuts. Elasto Proxy’s capabilities also include parts marking, kitting, and custom packaging. That’s why the mobile equipment industry asks us for cab and engine insulation, door and window seals, and heat blankets. Would you like to learn more about silicone connectors? Are you looking for value-added manufacturing? 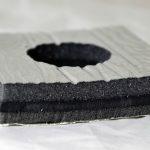 Do you need a complete sealing and insulation solution? To get started, contact Elasto Proxy.